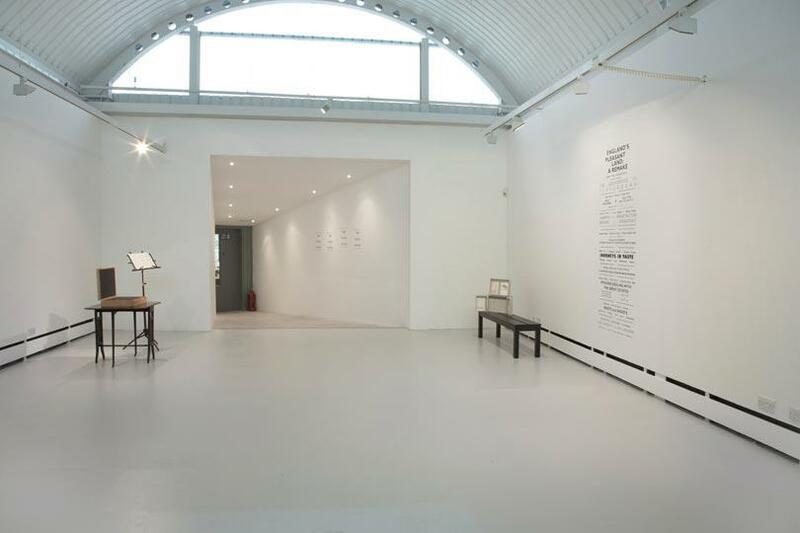 Time, Language, History: such interweaving narratives are the subject of ‘The Department of Overlooked Histories’ exhibition at Wysing Arts Centre, Cambridge. 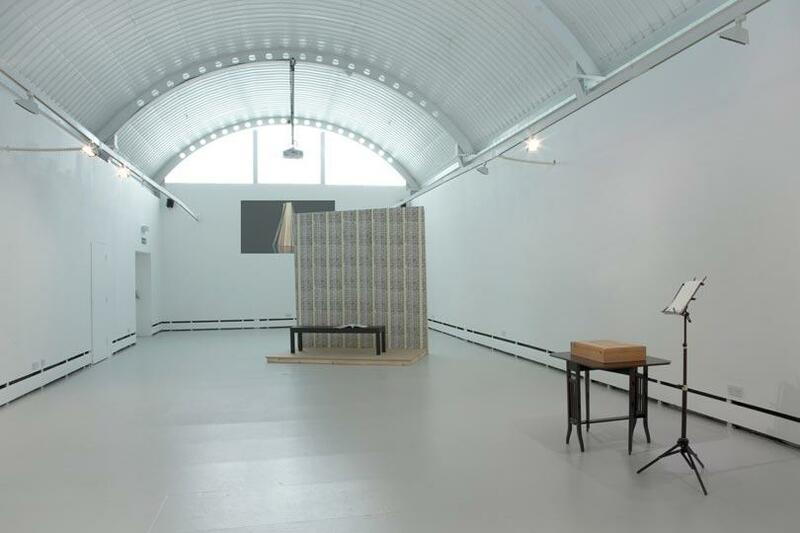 The exhibition is the result of research by invited artists from the third in a series of departments within Wysing’s 2011 residency programme, ‘The Institute of Beyond’. 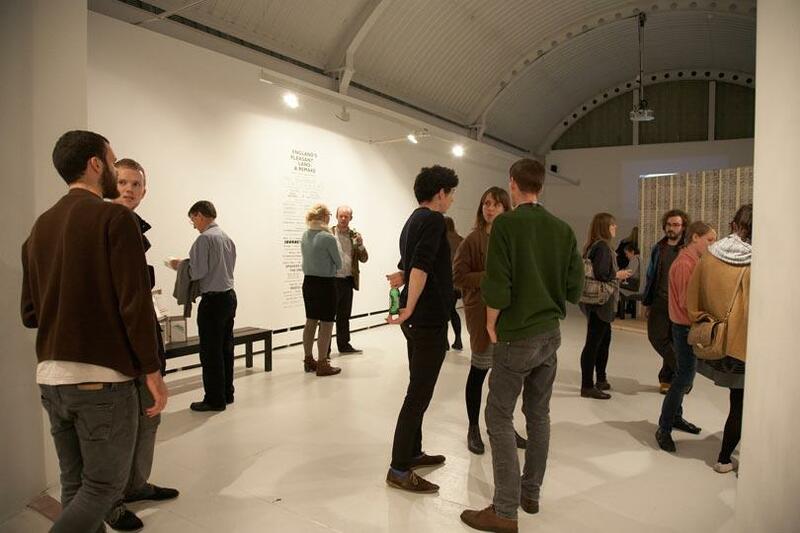 ‘The Cabaret of Overlooked Histories’, a one day events programme that coincided with the opening of the exhibition offered further insight into the thought processes and influences that went into the artists’ research, through a series of talks, lectures and performances. Ruth Beale’s ‘England’s Pleasant Land: A Remake’ is a contemporary re-working of E.M. Forster’s pageantry play, ‘England’s Pleasant Land’. First published in 1939, Forster’s play was designed to celebrate and promote the idea of the preservation of the countryside. Her on-going research is represented in the exhibition as a series of pamphlets and screen-printed walls designed in collaboration with invited residential designers An Endless Supply. Beale lays out the manifesto for her project on a screen-printed gallery wall. 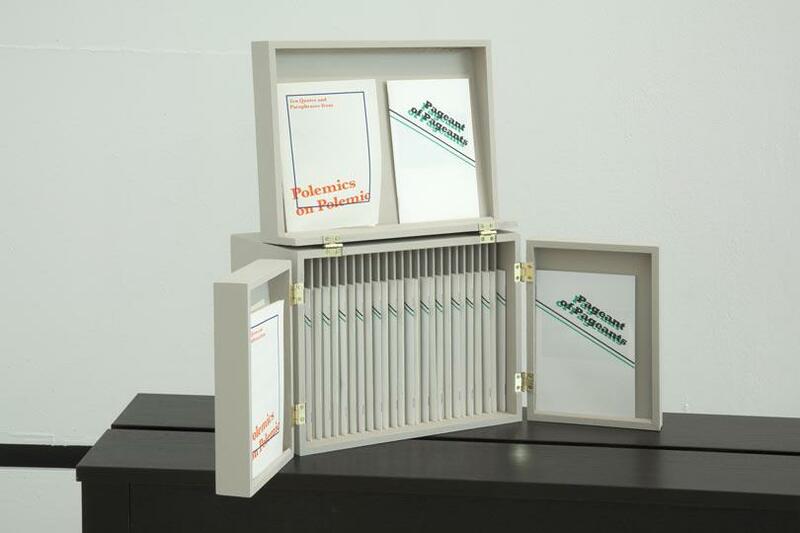 Printed statements such as ‘Land Ownership to Data Ownership’, ‘Planning and Infrastructure, Snobbery to Bureaucracy’, ‘Folk Melange and Selective Anthropology: The Reworking of Tradition’ assert the areas of discourse she wants to interrogate through a series of four vignettes presented throughout the day. Notions of historical preservation are parodied in a staging of a traditional pageantry play rehearsal. Here, Beale’s reprisal of this outdated form of entertainment addresses instead ideas of contested space, territory and class. 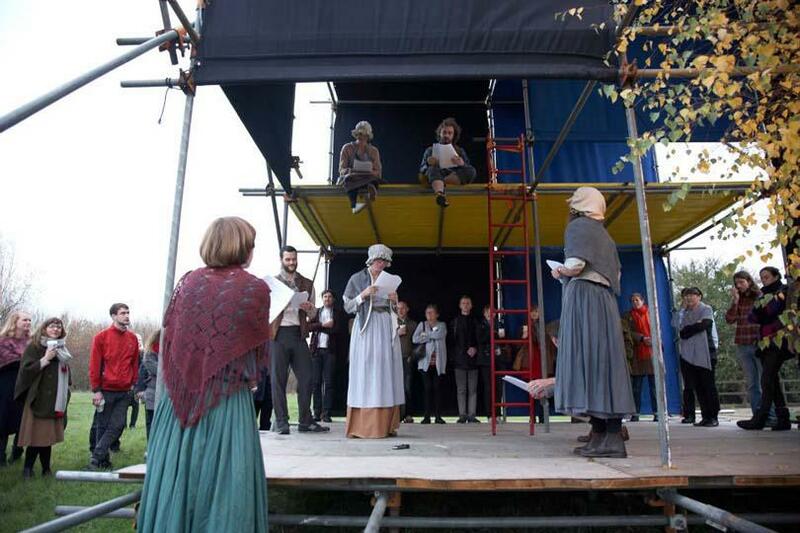 The cast of characters dressed in peasant garb, read from a scripted dialogue based on the nature of authenticity in contemporary society, individual tastes and the eschewing of historical narratives, although often breaking character to discuss the weather. 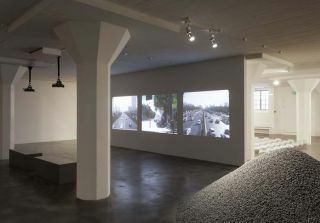 She invited sound artists Call and Response to interpret the question of ‘Land Ownership to Data Ownership’, who presented three original sound recordings that were re-recorded multiple times in urban public spaces and then layered. Through this process, even though the sound quality became degraded the recording itself retained the incidental noises which occurred in these spaces becoming a unique sound signature or ‘soundmark’ of the multiple environments it recorded, opening up a new discourse as to the problem of delineating virtual and digital space. 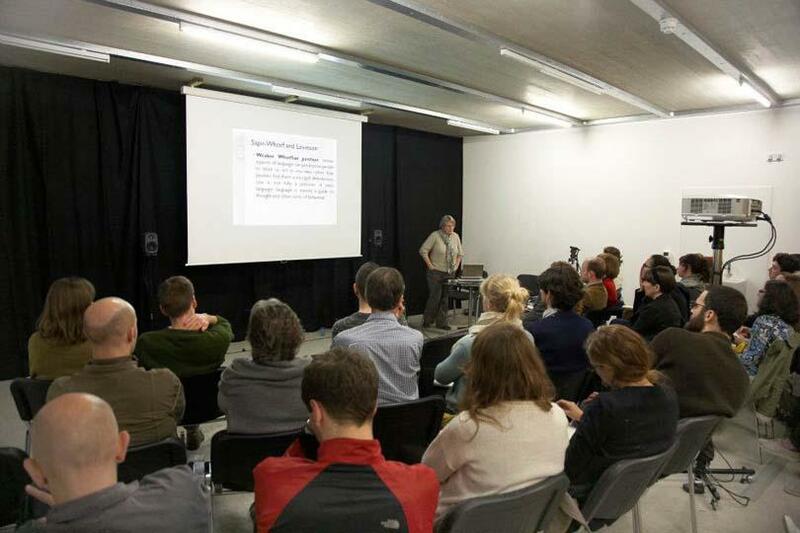 Under the theme of ‘Planning and Infrastructure’, architect David Knight presented a lecture on the history of his childhood town of Shoreham-on-Sea, and how planning permission laws have re-shaped the landscape of the town. The Traditional Music of Cambridgeshire Collective offered a new perspective on ‘Folk Melange and Selective Anthropology’. 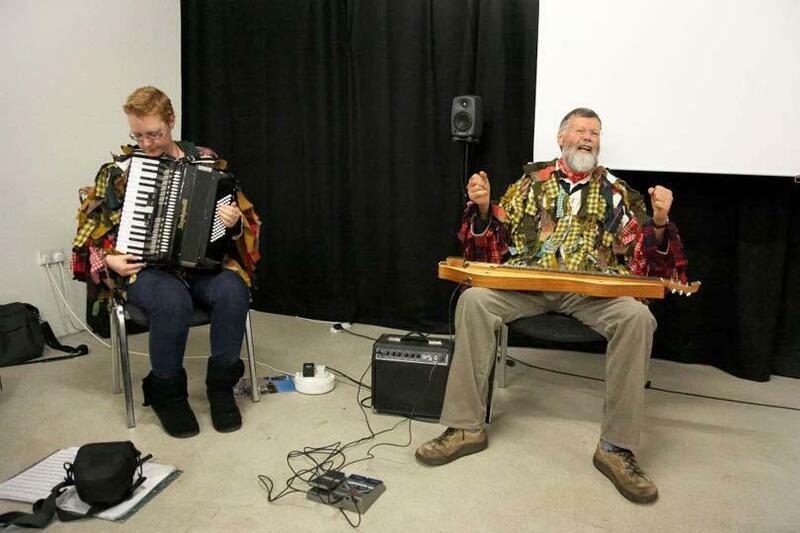 Performing old folk songs in ragged costume, Nigel Pennick and Helen Starksfield inform us of the hidden local meanings and histories inscribed within the lyrics. Church bell ringing in a countryside town was essentially one of the earliest and effective forms of communication, pre-dating the printed word. It was used to mark the time of day or to summon the parishioners to Church on Sunday. 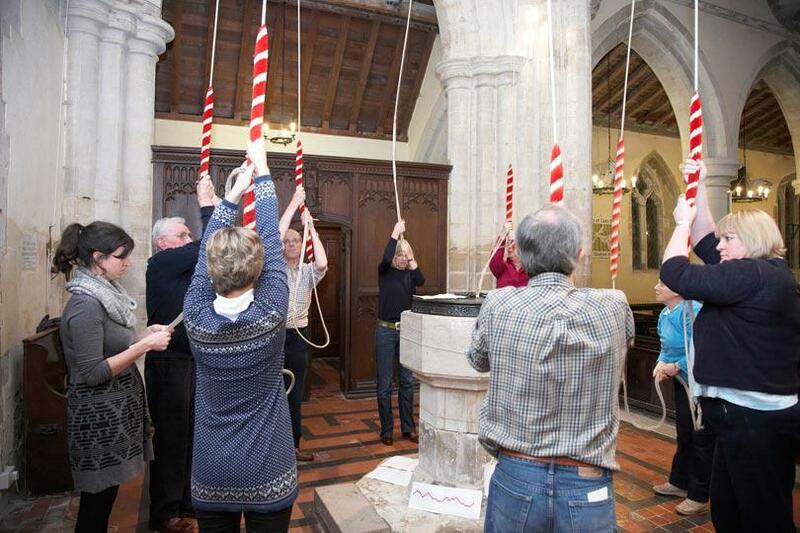 Through her on-going investigation into the history of bell ringing, Emma Smith has composed a new composition for the bell tower at Bourn Church. 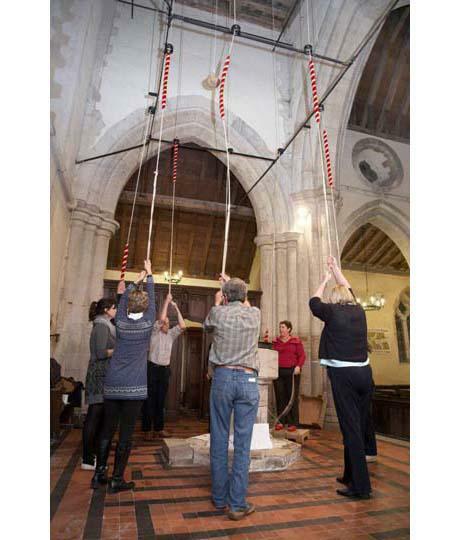 ‘Bourn Bounds Bob Major’ is a site-specific musical score debuted at ‘The Cabaret of Overlooked Histories’ and performed by the local bell ringing ensemble of Bourn under Smith’s conduction. Smith devised a complex mathematical structure based on the traditional bell ringing method ‘Plain Bob’. This structure operated as a three-dimensional model for mapping the geography of Bourn parish. Converting these logistics into musical keys of G Major, Smith created an aural cartography of the parish boundaries of the village of Bourn. Listening in the gloom of Bourn Churchyard, with every peal of the bells I was experiencing every route from the Church tower to the thoroughfares and village roads. 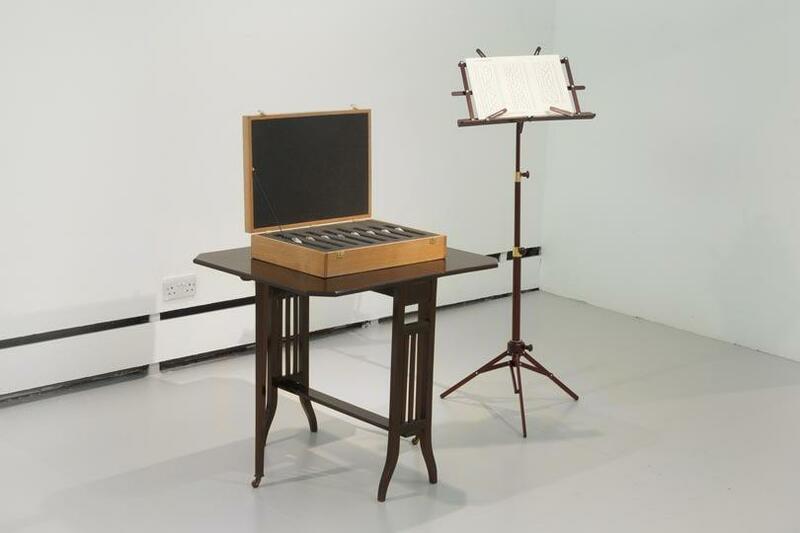 For ‘The Department of Overlooked Histories’, ‘Campanalogia: Bourn Bounds Bob Major’ offers the viewer an opportunity to play the score with a set of hand chimes which correspond tonally to the Bells of Bourn Church and the accompanying musical score. The work of collaborative duo Karin Kihlberg and Reuben Henry plays with the notion of how we experience and understand language, time and space through linear and non- linear constructs. 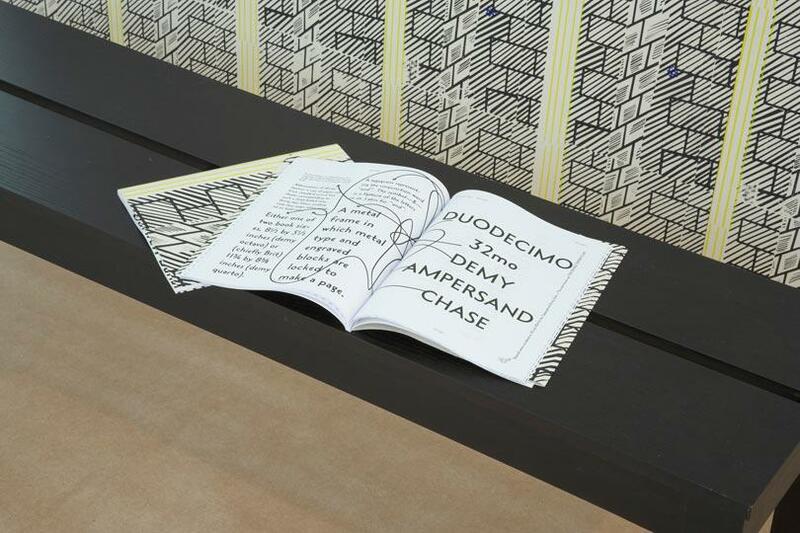 In their video work ‘Analytical Chronology of Three Dimensions’, they present alternating views of a book within space. 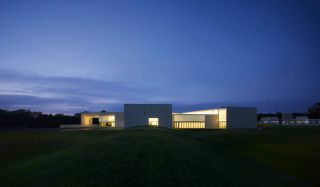 The disjointed camera angles at first present the book as an independent object, then as an object located within an environment, before finally expanding to reveal the environment itself - the Wysing gallery space. The video features a voice-over narrative scripted from different conjugations of the words ‘do’, ‘speak’, ‘think’ and ‘see’. 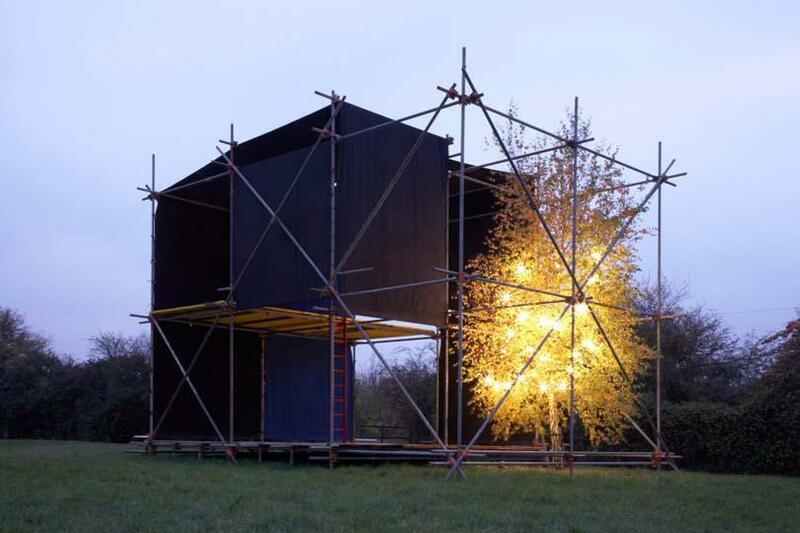 It whimsically illustrates the different thought processes involved in the structuring of language and communication and how linguistics is intrinsic to our comprehension of material and our own spatial environments. 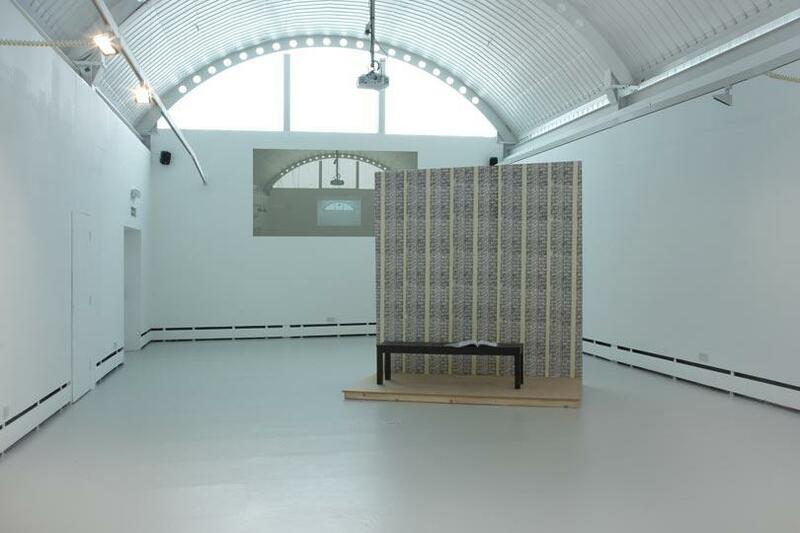 A wallpapered wall and platform situated in the middle of the gallery space represent An Endless Supply’s contribution to The Department. 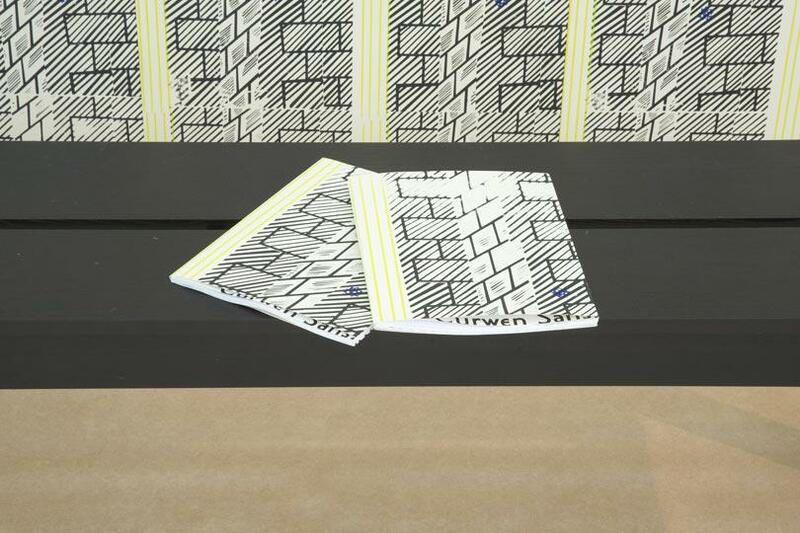 What appears as a three-dimensional drawing of brickwork reproduced as screen-printed wallpaper is in fact their revival of a wallpaper design by an early 20th-century Cambridge Printing House, Curwen Press Papers. ‘Curwen San Type Specimen’ is the excavation of a long lost typeface, ‘Curwen Sans’, originally drawn by Harold Curwen in 1911. Here, An Endless Supply have recreated the one hundred year old typeface as a publication which features written contributions on the nature of revival and history. The very nature of this installation re-establishes the necessity for archiving not only the written word but also its visual format. It also raises the question of how technological advancements and the digitising of information can allow for these minor histories to be overlooked.